Lynn Majidimehr makes her home in the Pacific Northwest, and it's easy to see that she draws inspiration from the beautiful landmarks there. 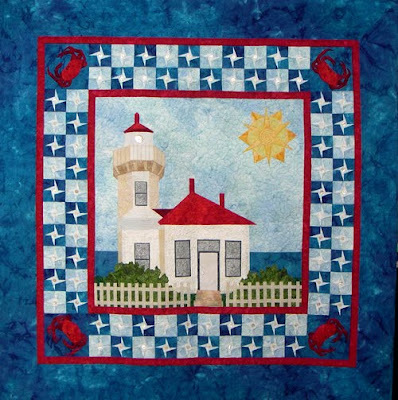 Here is her charming design of the lighthouse in Mukilteo, Washington, which faces out onto the Puget Sound. (Interested in Northwest pronunciation? These names are pronounced as muck-il-TEE-o and PYOO-jit !) The lighthouse sparkles with realism, due to the perfect perspective in which it is designed. The crabs in each corner of the quilt provide a touch of whimsy to this very eye-catching scene with its starry border and neat picket fence. 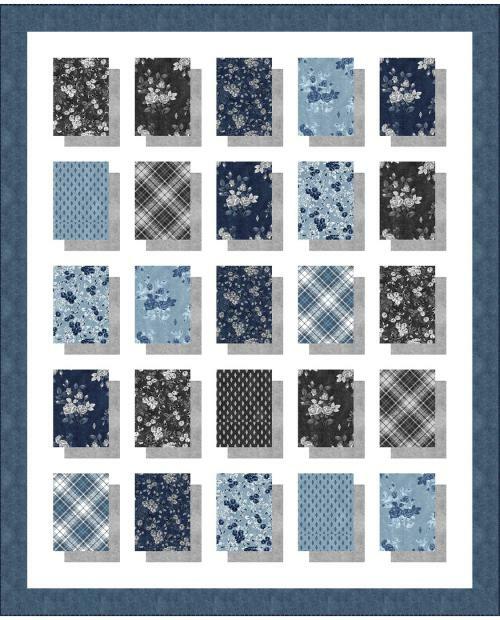 If you'd like to purchase the pattern, it's available at her website, LAM Designs. 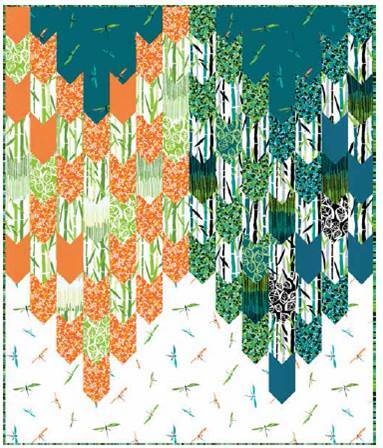 On Lynn's blog you can read about her own inspiration and designs. 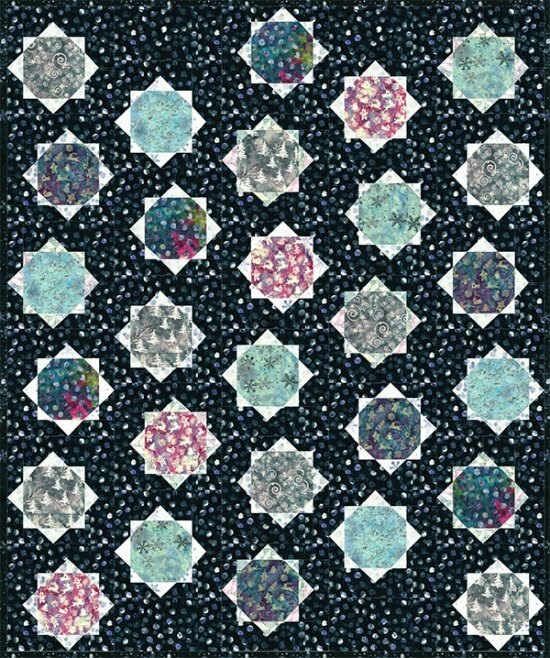 We're eagerly anticipating her new book to be published in October 2010, Flower Show Quilts: Stunning Applique on a Patchwork Canvas. Using solid batiks with a hand-painted look, Maggie Dillon has created sailboats that look both stately and lively. 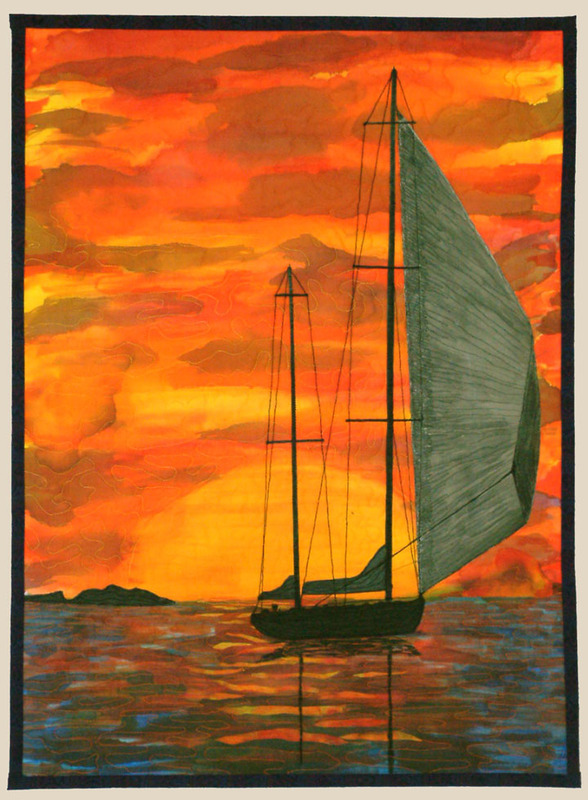 This is one of Maggie's original designs in textile art, and it reveals her skillful use of color and pattern to portray the scene. 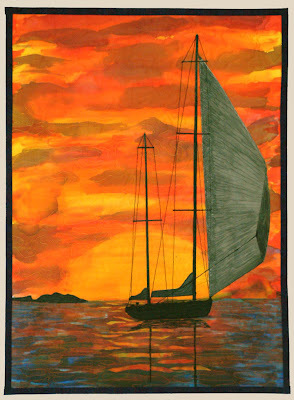 She has defined the line between the horizon and the ocean with a small strip of darker batik. 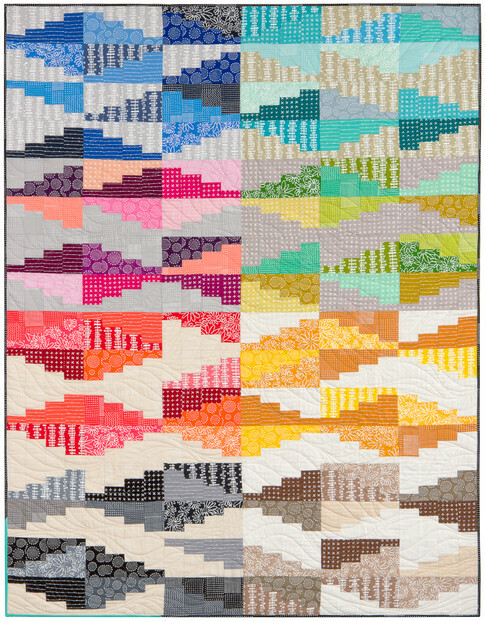 She cut the strip with a gently rolling motion to portray the movement of the waves against a timeless sky. To see more of Maggie's original art quilts, including her fantastic portraits in fabric, please visit her site, The Artist's Treatise Portfolio. Image credits and links: Images are shown with the generous permission of the artists. 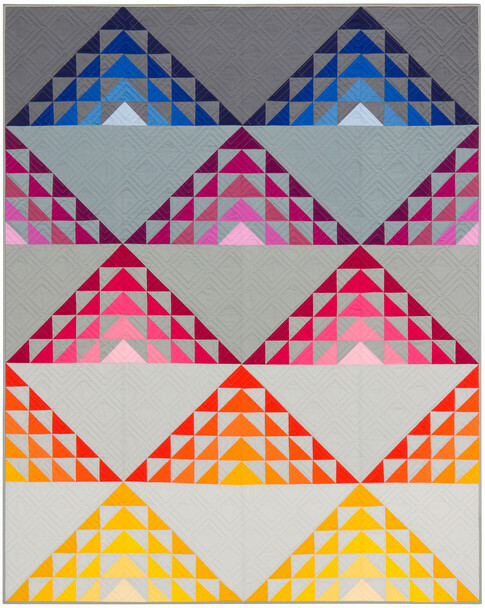 If you've been following our blog over the last few months, you know that we can get pretty excited about quilt shows.... and about some of the spectacular opportunity quilts we've come across recently. 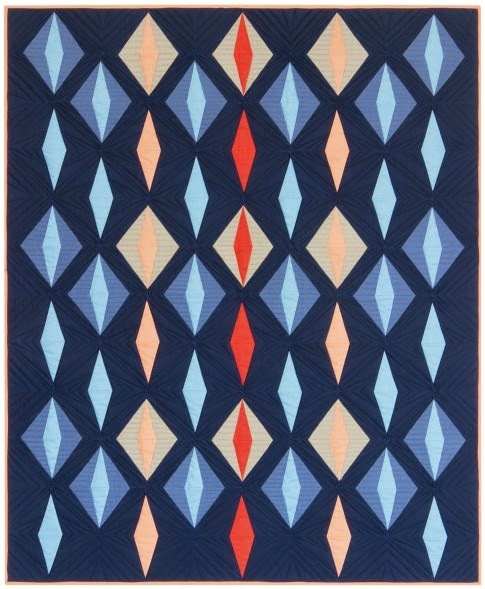 The quilt we're showing today really knocked our socks off. 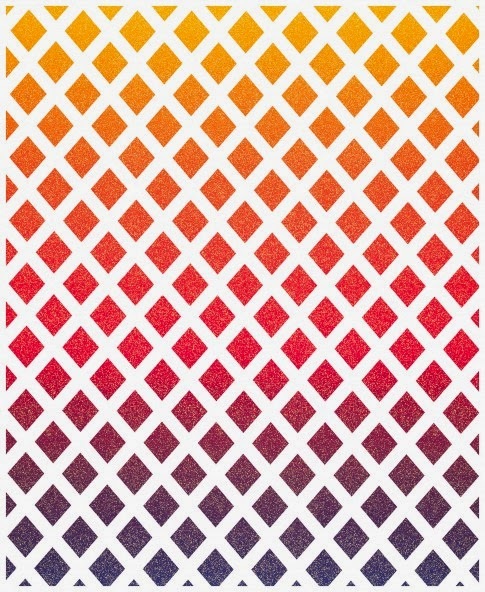 Colors of our World, 96 x 103. 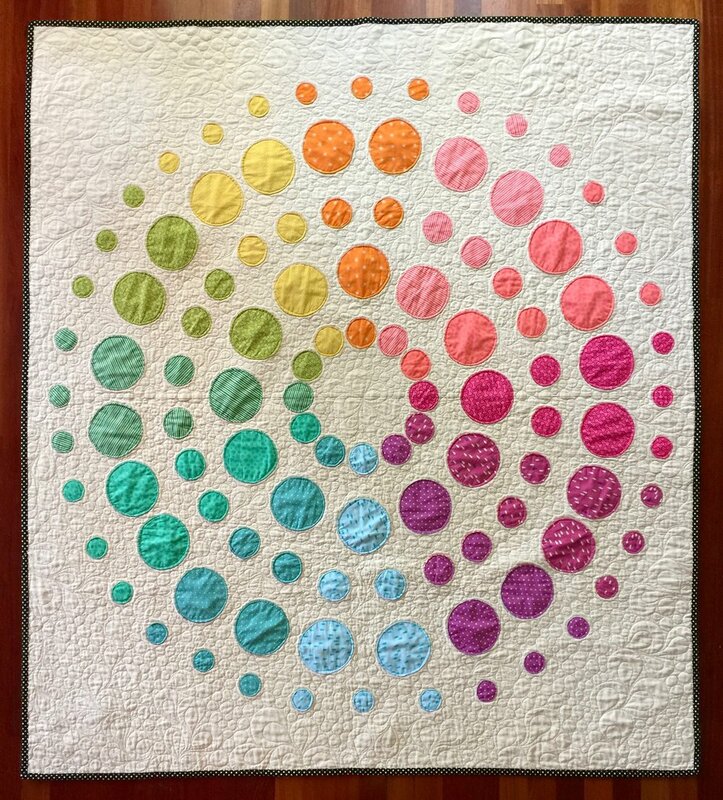 Designed by Margaret Heath Hartranft and pieced, appliquéd, and assembled by over 55 members of the Nimble Fingers Quilt Group; machine quilted by Marjorie Coffey. 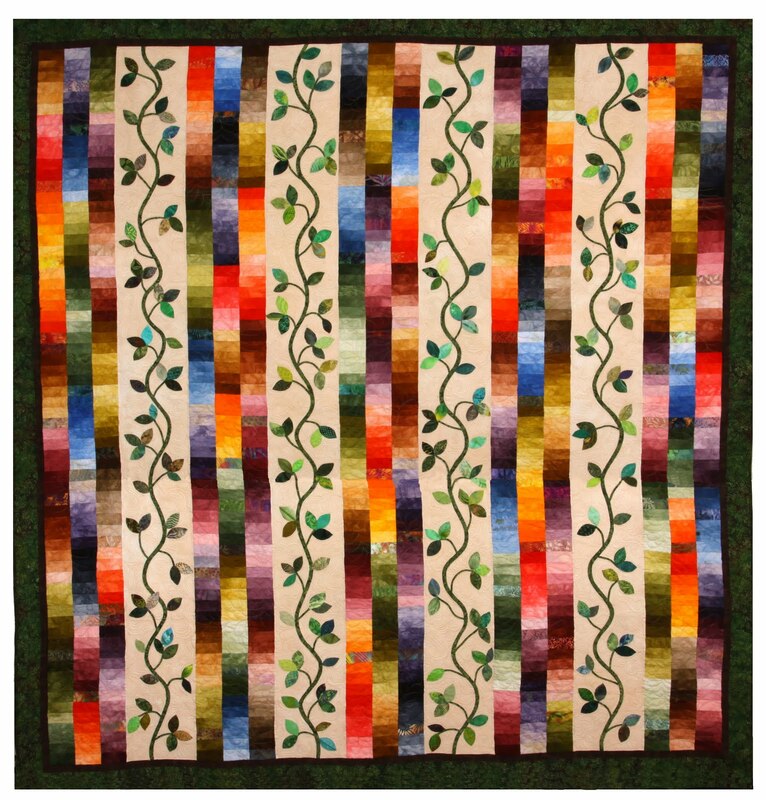 This gorgeous quilt features pieced panels of luminous hand dyed cotton sateen with alternating panels of hand appliquéd vines and leaves in batiks. 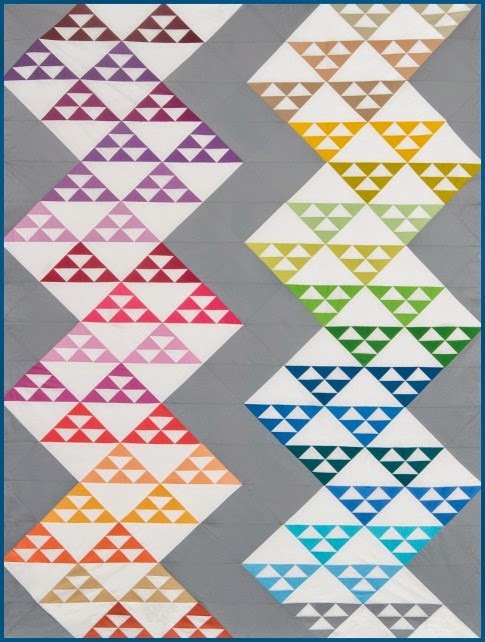 Dyed by guild members, the pieced panels consist of 6 values of 28 colors (that's 168 shades, folks). 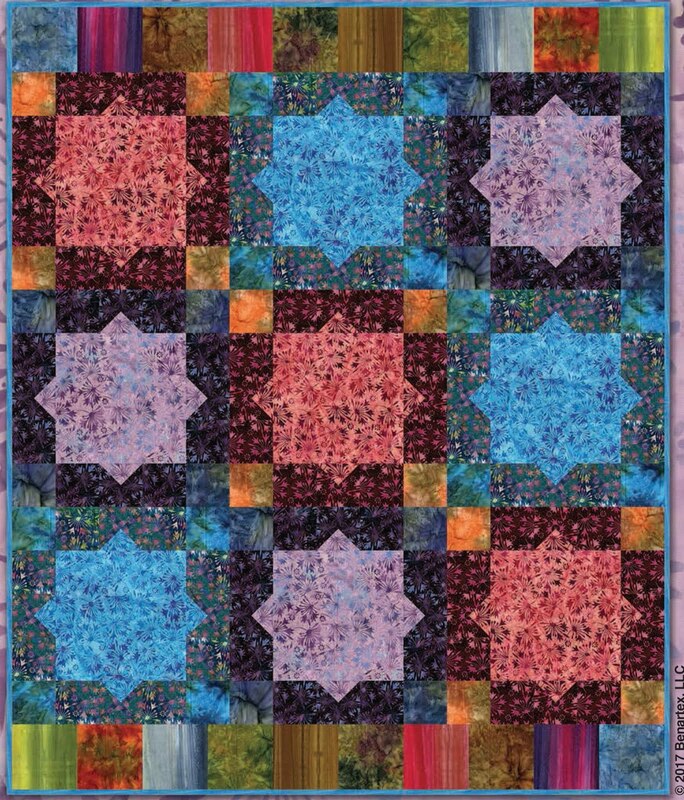 The background and backing are also hand dyed. Dyeing was done in 3 consecutive full day events in a member’s home. 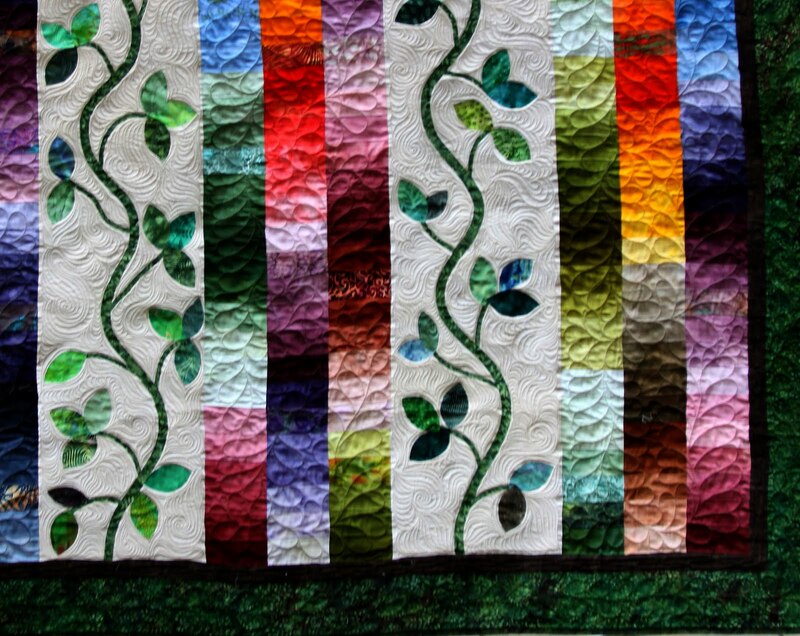 The lovely quilting, shown in the detail photo below, features McTavish style swirls in the leaf panels and large feathers in the pieced strips. 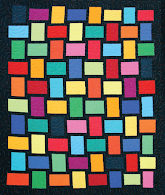 The Nimble Fingers 2010 Quilt show is October 15-16 at The Universities at Shady Grove, Bldg. 2, 9630 Gudelsky Dr., Rockville, Maryland 20855. Hours are Friday, 10 am to 7 pm and Saturday, 10 am to 4 pm. 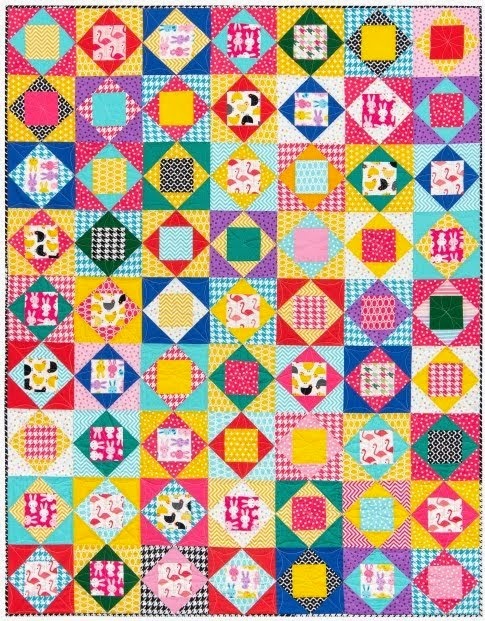 Tickets for the quilt are $1 each or 6 for $5. The drawing will be held in the last hour of the show and you need not be present to win! 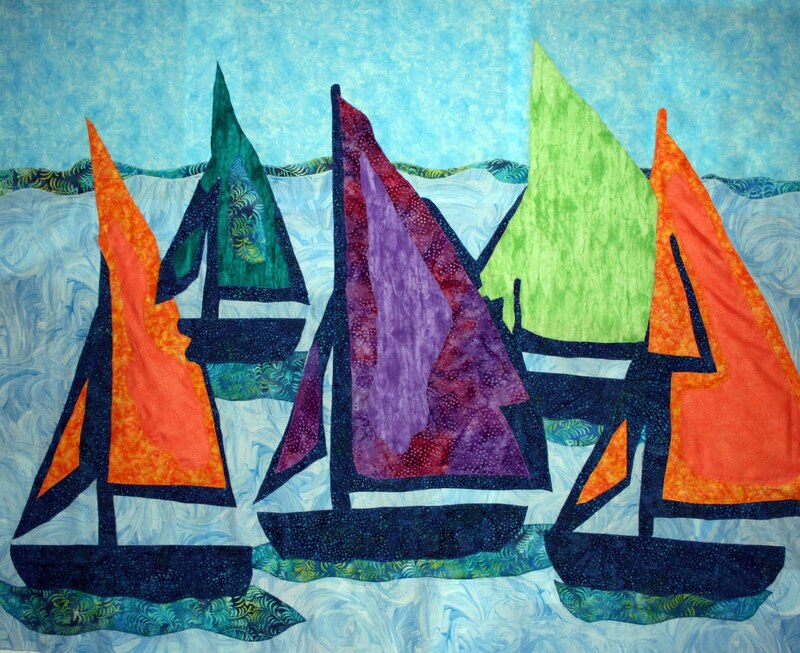 For additional show information contact the show chair, Beverly Ferrell at beverlyferrellquilts@yahoo.com or 301 869-3249; or visit the Nimble Fingers website. p.s. 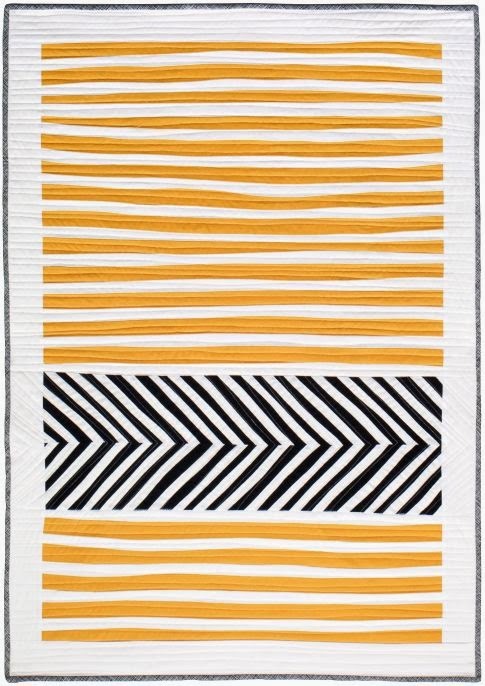 You might also be interested in the work of one of the many talented members of the Nimble Fingers Group: Debra Gabel of Zebra Patterns. 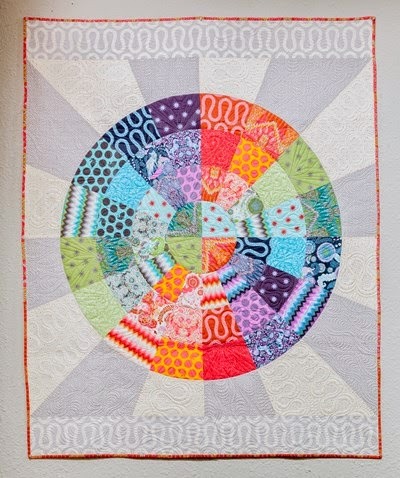 We recently interviewed Debra and showcased her fabulous Stamp Quilts, here. 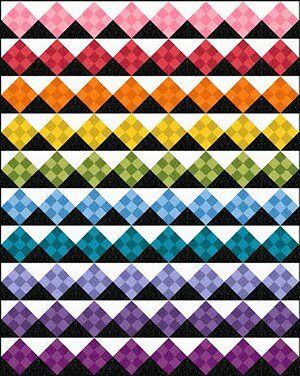 Image credits: Images are provided with the generous permission of the Nimble Fingers Quilt Group. In our Baskets Part I article ( from July 10 below), we featured basket quilts made from pieced patchwork. 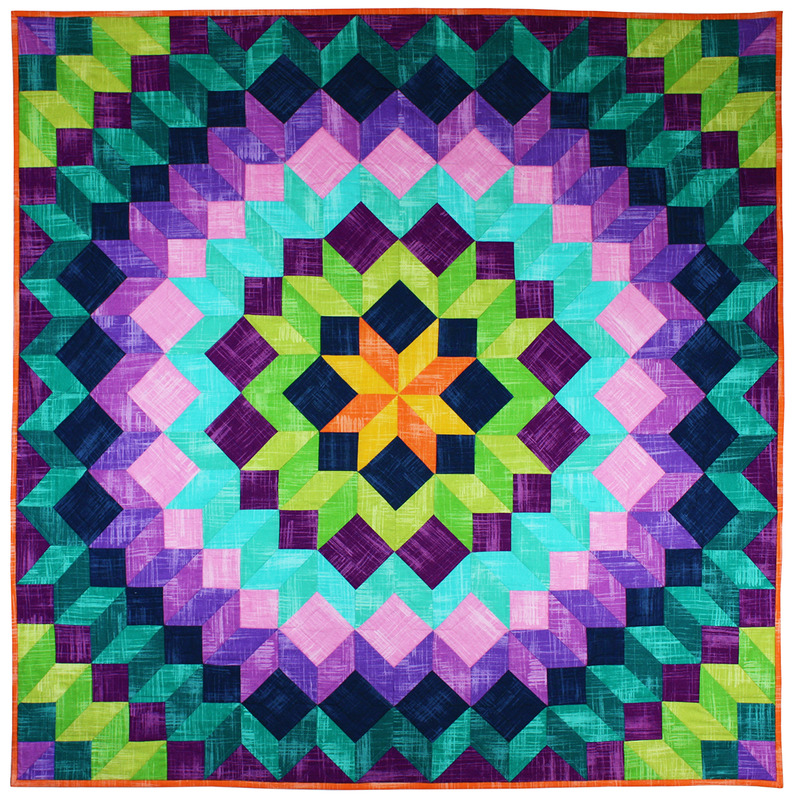 This time, we are spotlighting basket quilts made by applique. 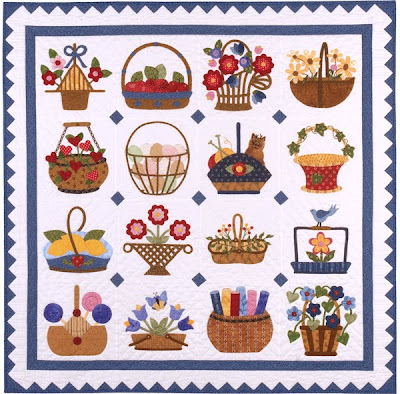 If you love romantic, graceful patterns that evoke the elegance of yesteryear, then you'll love applique patterns featuring baskets as their focal point. 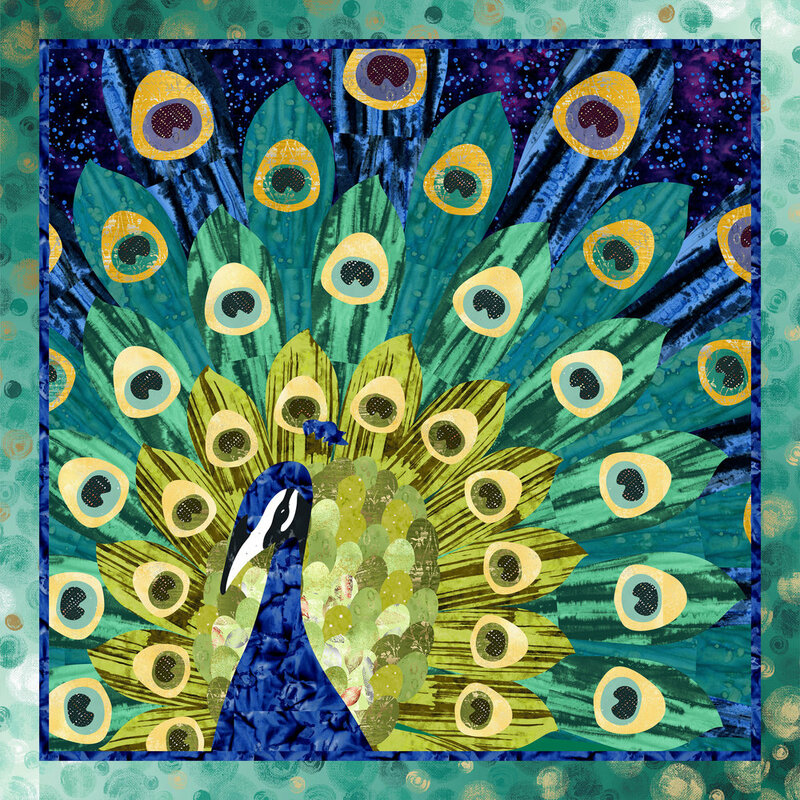 Pearl Pereira was a guest artist and teacher at the esteemed Elly Sienkiewicz Applique Academy in February 2010, near Williamsburg, Virginia. She has fashioned a tall basket with curved handles that reflect the curves of the stems of the delicate dogwood blossoms, bluebells, and berries. The fruit-laden vines that drape languorously from each side provide a lovely symmetry to this work, while the proud cardinal and inquisitive bumblebee add a joyful touch. Pearl has used delicate pinks, reds, and blues to create a basket of botanical wonders. 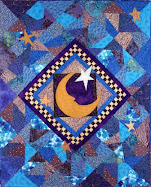 For more goodies from Pearl, including her excellent DVD, Applique Techniques With Pearl P. Pereira, please see her website, p3designs. 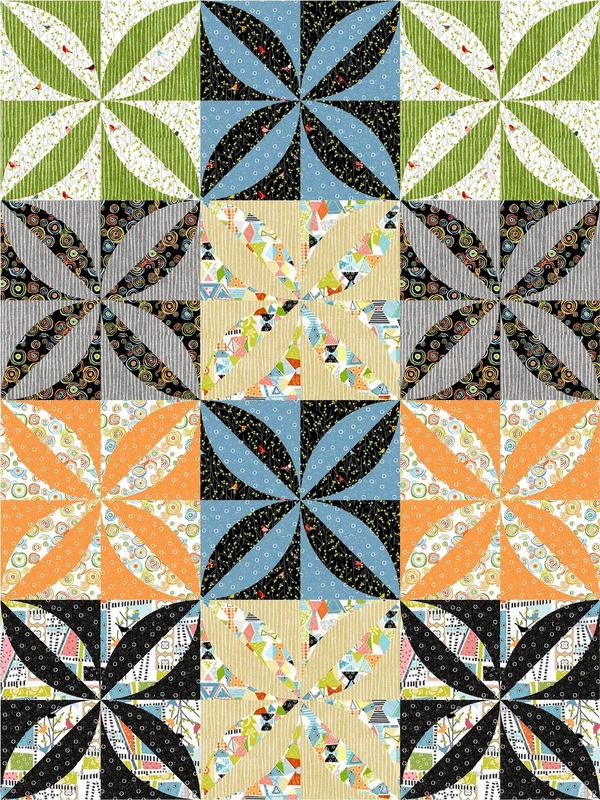 In addition, we're thrilled to announce that Pearl Pereira will introduce her gorgeous Virginia Bouquet pattern for sale this autumn, at the Houston TX International Quilt Market . 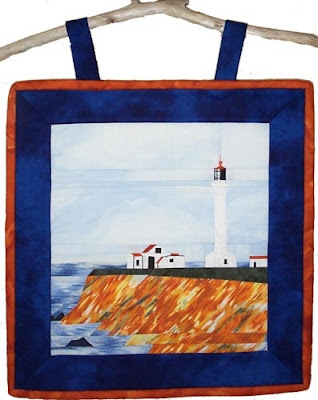 Judy Severson is another renowned guest artist at the Elly Sienkiewicz Applique Academy. 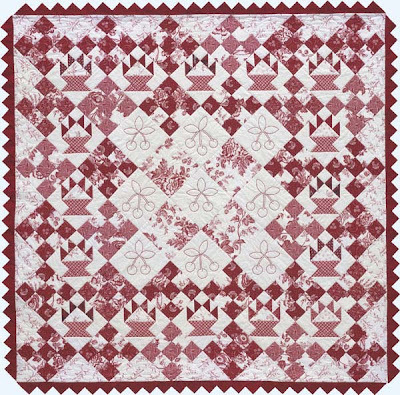 With its hushed burgundies and golds, "Quilt Jamboree" is reminiscent of an enchanting Victorian rose garden. 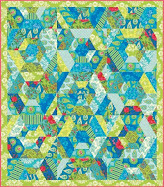 We also love the captivating sampler blocks carefully placed around the sophisticated border. One of Judy's many specialties is the centuries-old tradition of Broderie Perse, whereby flowers printed on fabric are carefully "fussy cut" ffrom that fabric and appliqued onto a wholecloth quilt to make an exquisite bouquet, as shown above. 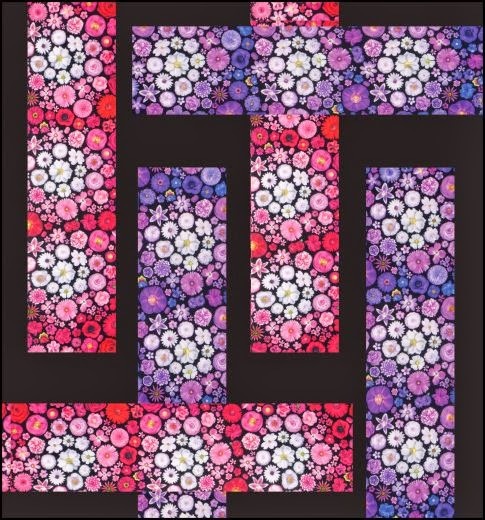 Judy writes, "When creating a floral motif (Broderie Perse) quilt, I start with the layout of the flowers in the fabtric and study how they are grouped with other flowers. I let it suggest if it would make a medallion center, or whether it would be better used in a border, or both. 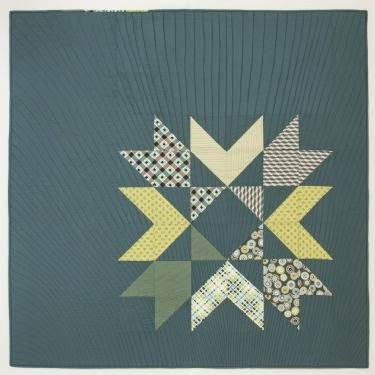 Studying and seeing quilts from the past, as well as the quilts made to day, gives me inspiration." 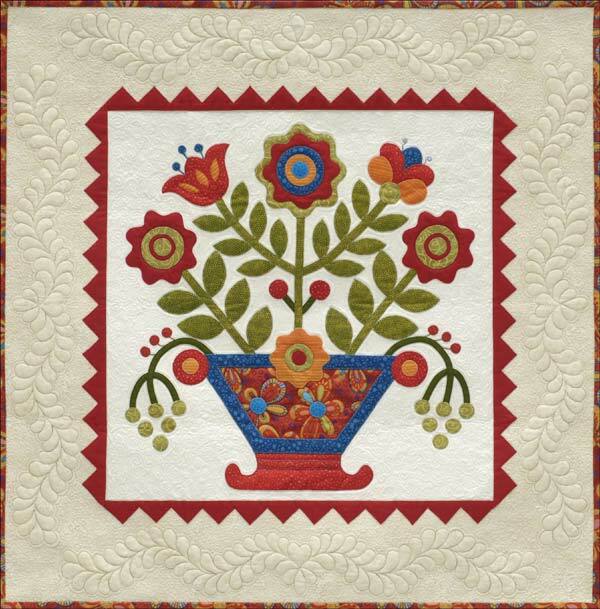 For more information, take a look at Judy's highly rated, fascinating book, Flowers In Applique: Fast and Simple Quilting With Printed Motif Fabrics. 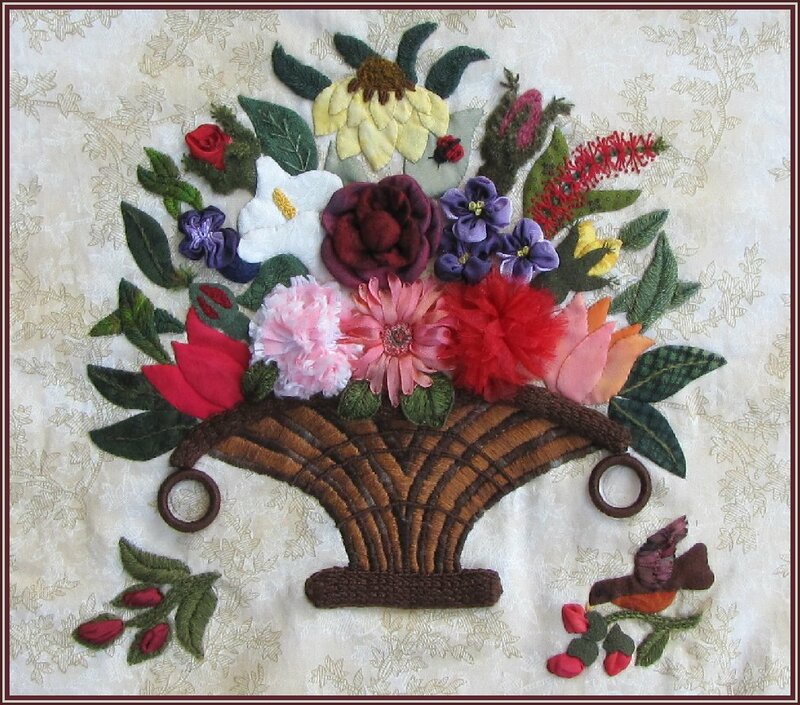 In Botanical Artisan Basketry, Janice Vaine has created a breathtaking block by combining traditional applique with stunning embroidery. 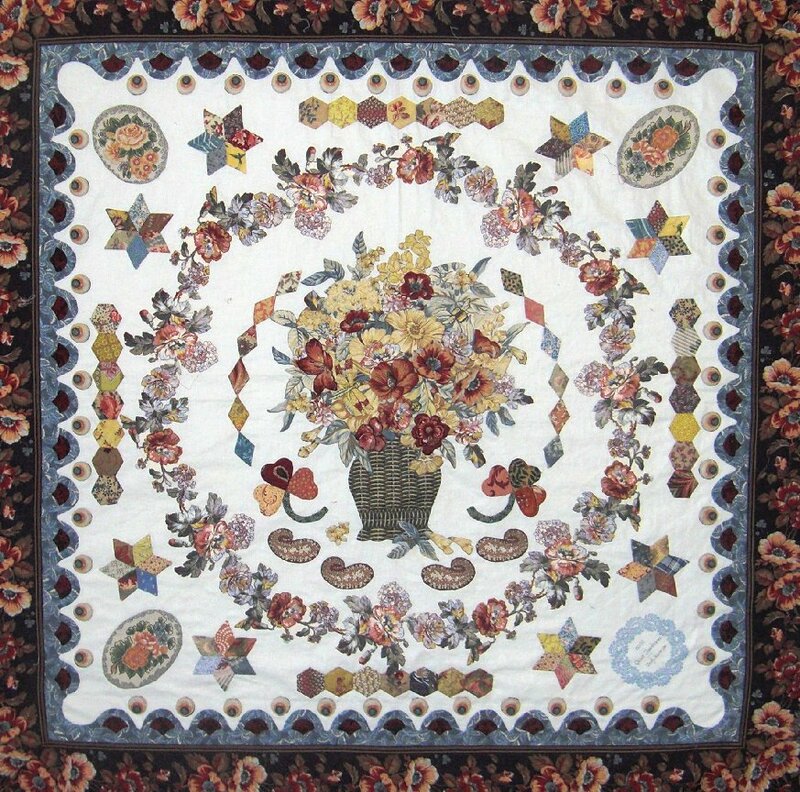 Using embroidery with silk floss, wool, and ribbons, she has embellished the tulips, rose buds, lilies, and gerbera daisies joyfully arranged in the basket, to create a dazzling dimensional effect. The little robin on the rose branch lends a lighthearted touch to this floral feast. 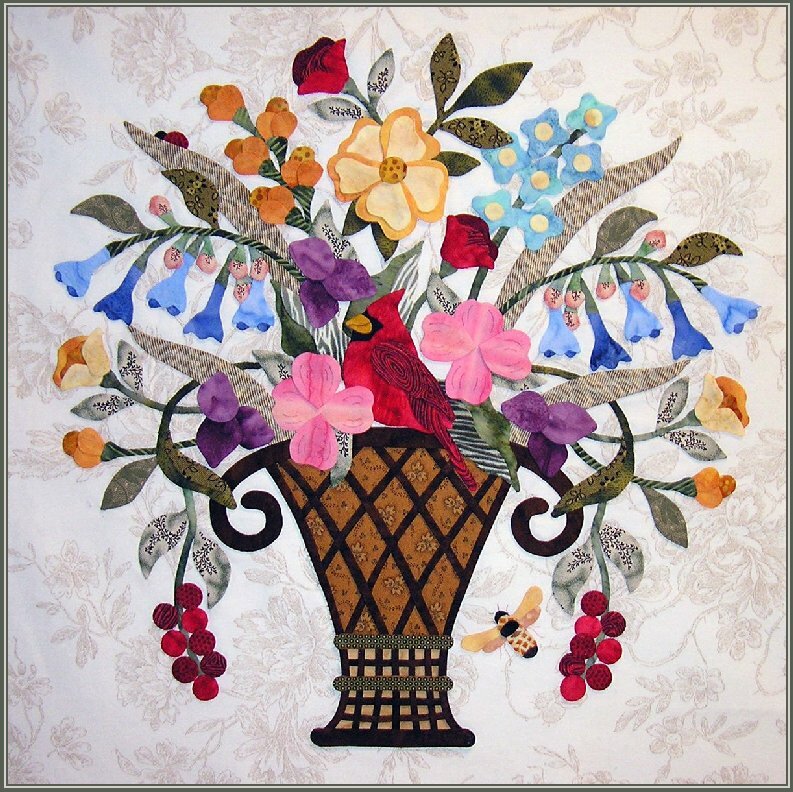 A well-known expert in the applique field, Janice was the guest designer of the ancillary projects for Elly Sienkiewicz's noted book, Baltimore Elegance. Also, check out Janice's website, the Graham Cracker Collection, an awe-inspiring offering of patterns for needleart fans, which includes minature punch needle embroidered quilts along with full size quilts. 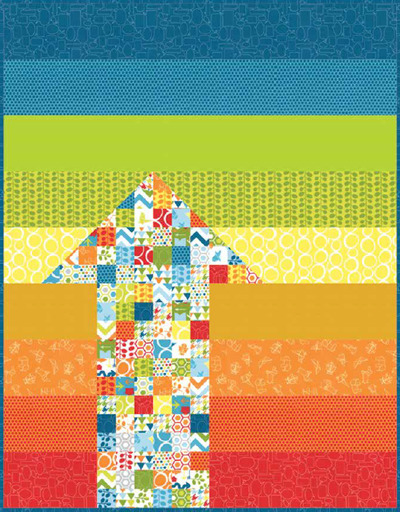 Best of all, Jan writes that this block above will be part of a quilt top of blocks that she has taught as a guest artist at the Elly Sienkiewicz Applique Academy ; and she will be introducing her new book on applique and embellishing at the Houston TX International Quilt Market 2010 this autumn. 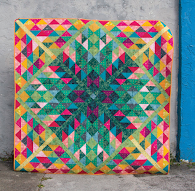 Kim McLean has created a marvelous, richly detailed quilt pattern with fabrics designed by Kaffe Fassett, whose bold colors explode right off the page. 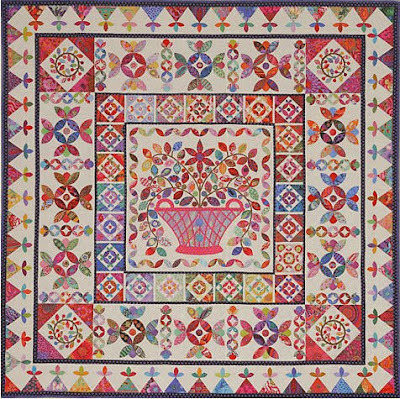 Brilliant orange-reds, blue-violets, and pinks create a vibrant basket bouquet medallion, surrounded by borders of absolute floral delight. 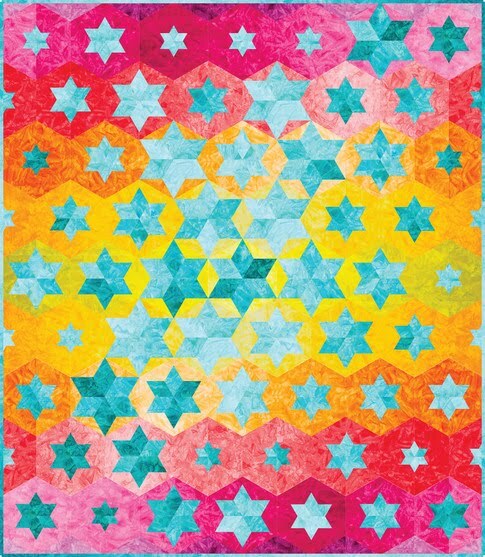 You can purchase the pattern, along with a separate starter fabric pack at Glorious Color, a website that is a real feast for the eyes. 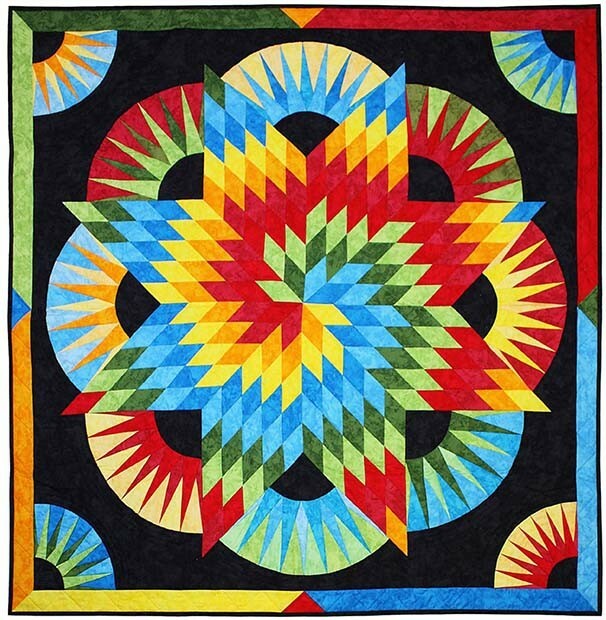 Some of the cutest, most imaginative quilts around are designed by Kay MacKenzie, and "Sixteen Baskets" is no exception. These adorable baskets are brimming with the bounty of life, including flowers, food, valentines, and best of all -- fabric ! 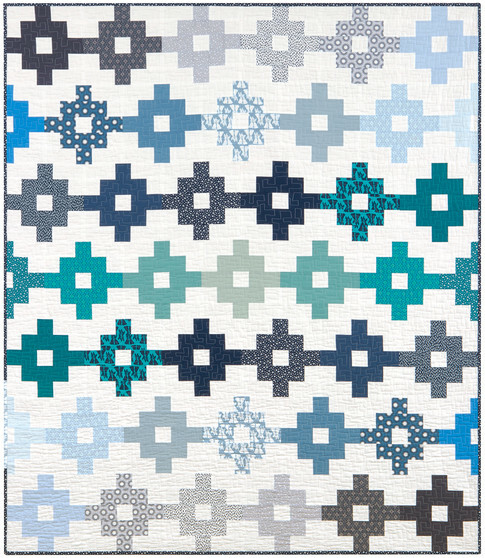 The red, white, and blue motif provides country charm to this darling design, and the dogtooth border adds extra sparkle. 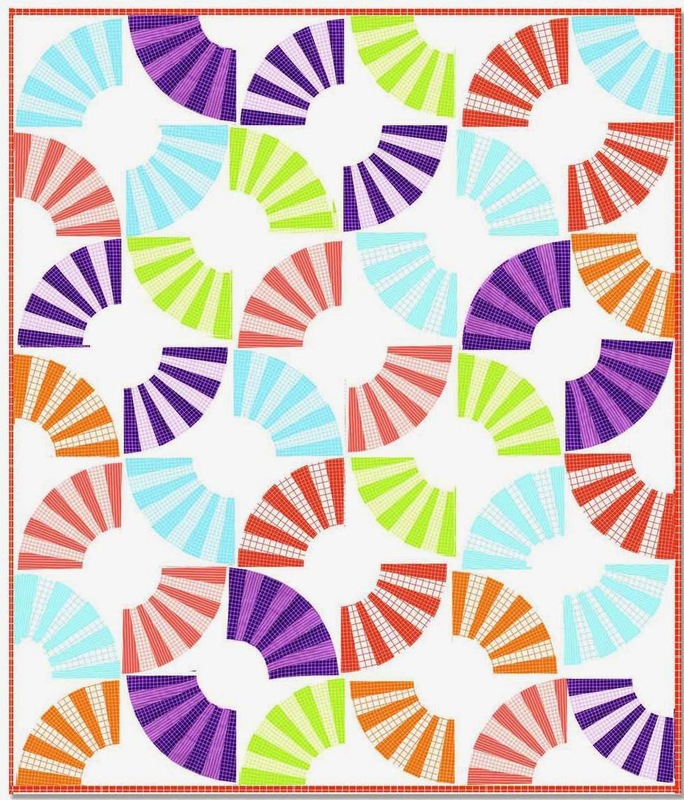 All 16 of these designs and very clear instructions are included in one of Kay's many books, Baskets To Applique, available at her Quilt Puppy website. 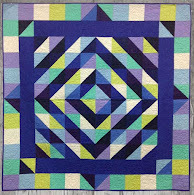 Kay also has a wonderful blog, All About Applique. 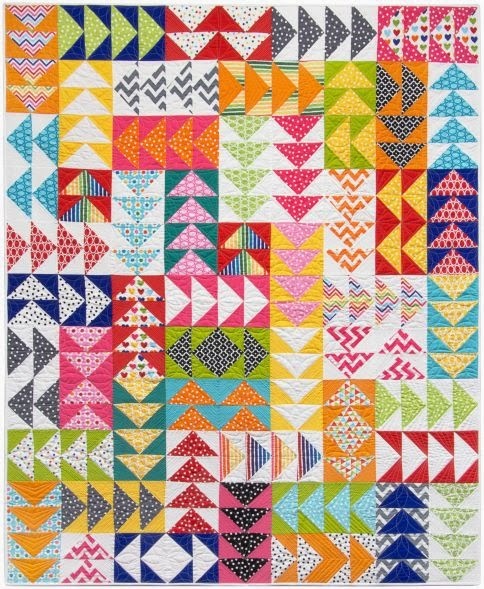 If you're headed to the International Quilt Festival in Long Beach,California, which starts on July 23, 2010, be sure to stop in and say hello to Kay, who will be in booth # 922. 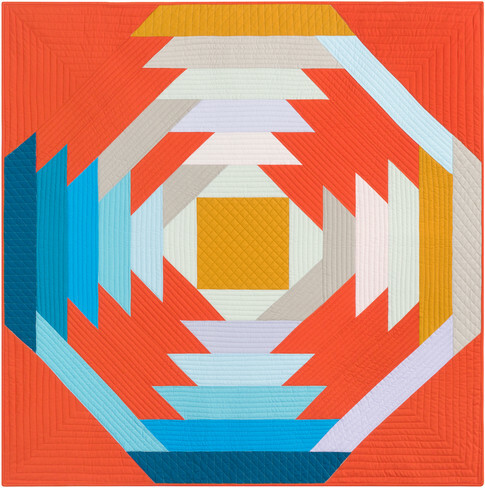 Sue Nickels and her sister Pat Holly, both award-winning quilters, have designed an applique guaranteed to brighten up any room in your home. Sage green, tomato red, and sky blue blend together perfectly for this basket design, where cheery flowers spring up exuberantly like a jack-in-the box. 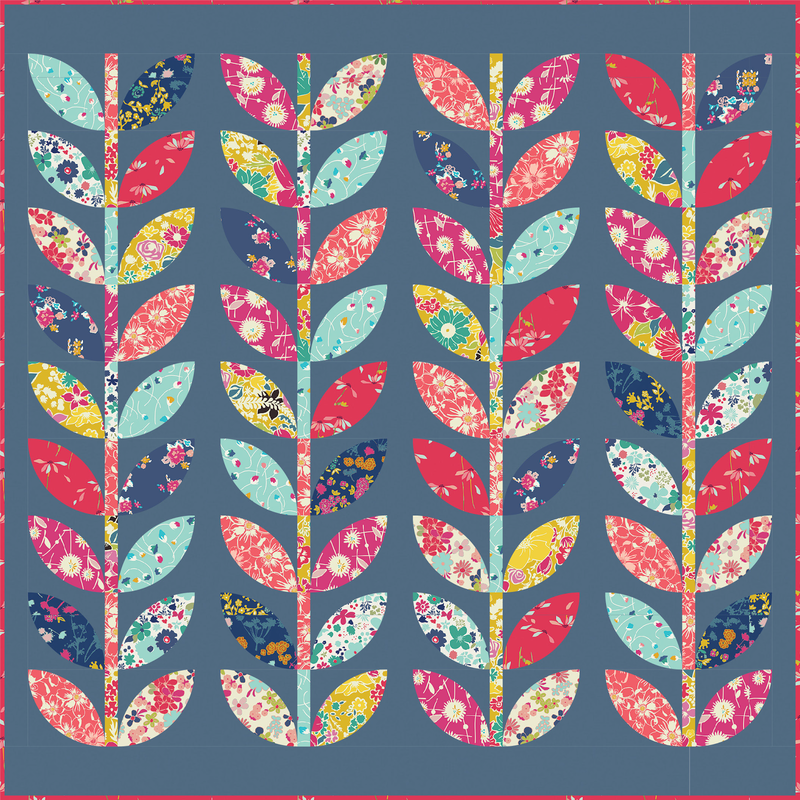 The ebullient red border adds an extra pop to the background. 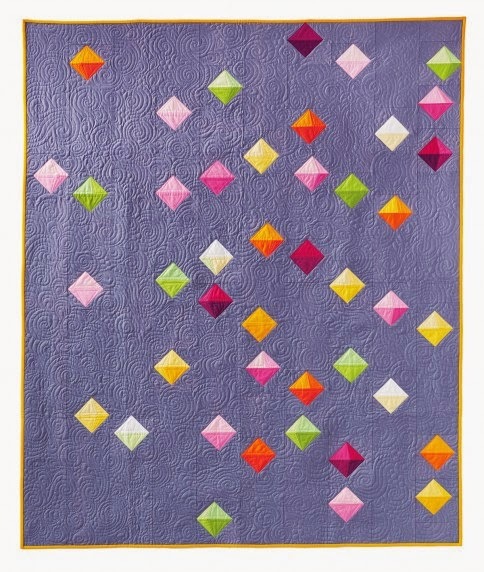 Suitable for a confident beginner, this quilt pattern is available from Sue Nickels' website. 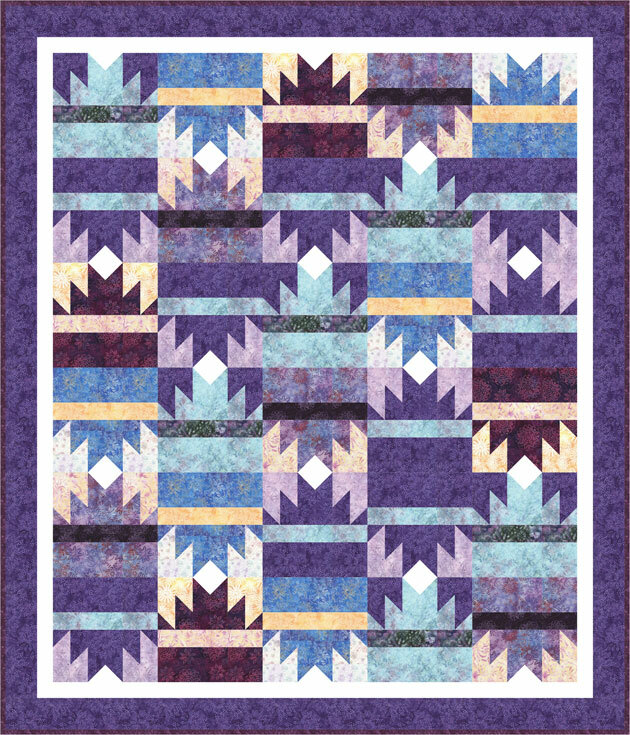 As a bonus, the pattern is included for the sprightly feather quilting design around the border. For more wonderful ideas on creating appliqued floral displays in containers, please see Sue Nickels' and Pat Holly's recent very inspiring book, Stitched Raw Edge Applique. 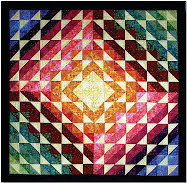 One of the most popular themes in quilting, basket quilts are fascinating because of their dozens of different blocks. Because baskets historically have been used to carry so many items into the house for the family, they are a cozy symbol of home and hearth. 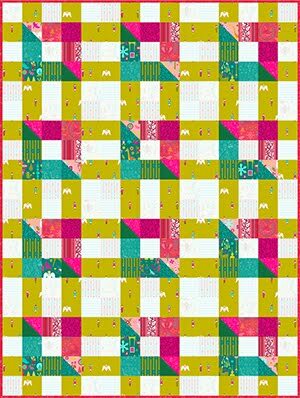 As you will see in these next two blog articles, there's almost an endless variety of pretty basket blocks and a variety of different ways to construct them. 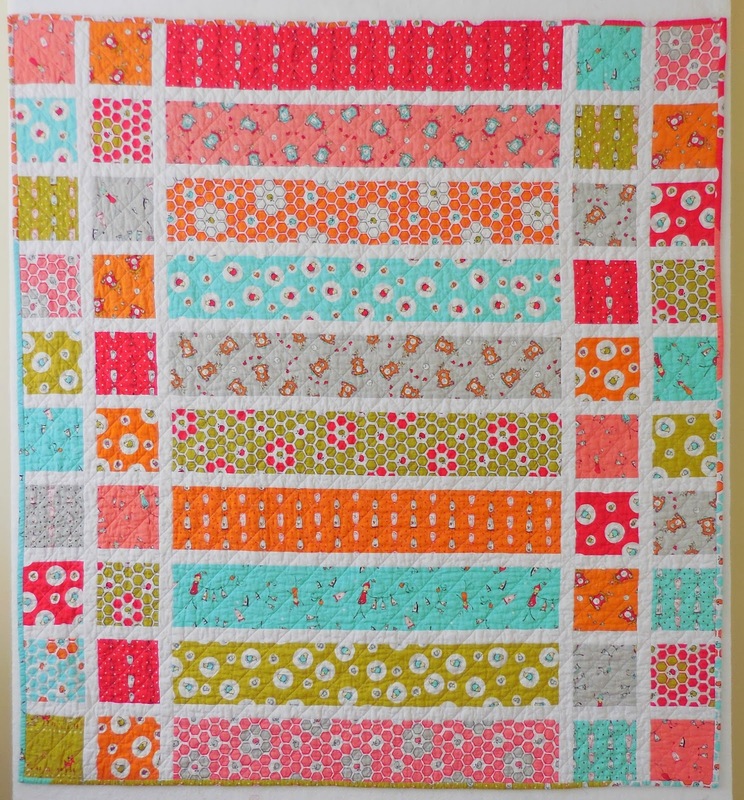 Glenna Hailey of Hollyhock Quilts designed this cheery quilt in 2006 for a sample in Karen Snyder's store, Anna Lena's Quilt Shop. 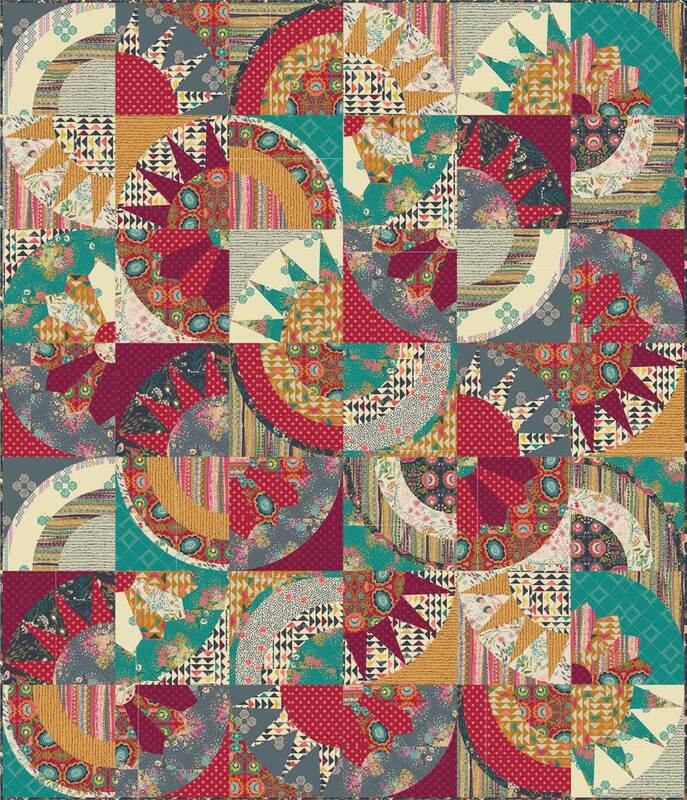 Warm colors and retro feedsack prints create such a whimsical and cozy look. We can't help but smile when we see that the rick rack motif, which forms the basket handles, has been extended to dance around the outer border. 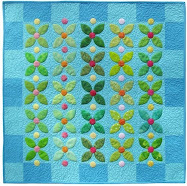 Petite appliqued flowers add extra charm to the border. 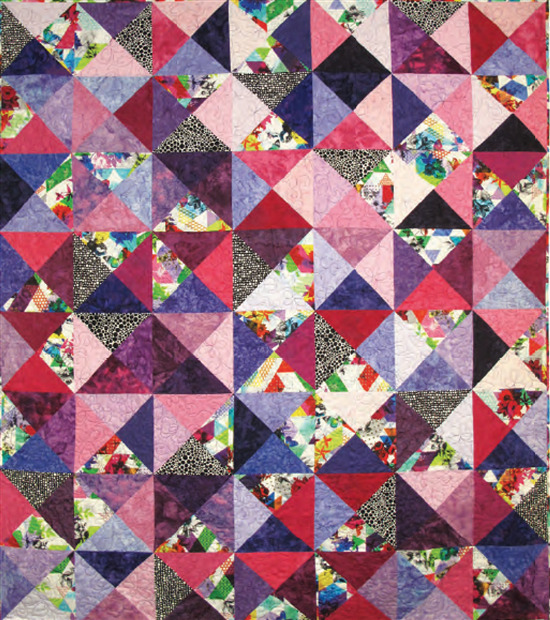 As is the case with many patchwork baskets, the base and bottom of the baskets are composed of right triangles. 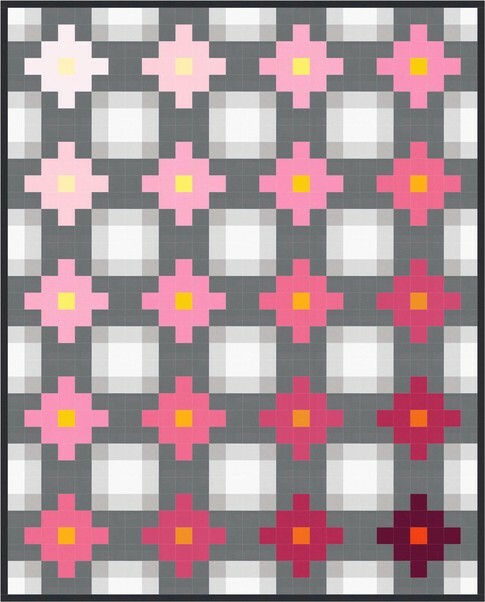 For additional patterns by Glenna Hailey, see the Hollyhock Quilts Patterns Page and blog. 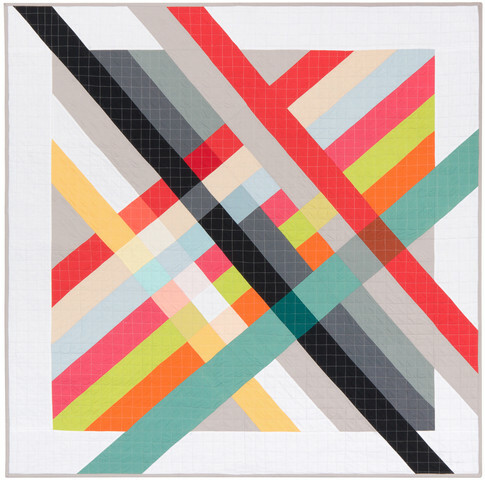 Also, visit Karen Snyder's store at Anna Lena; her blog is Anna Lena Land. 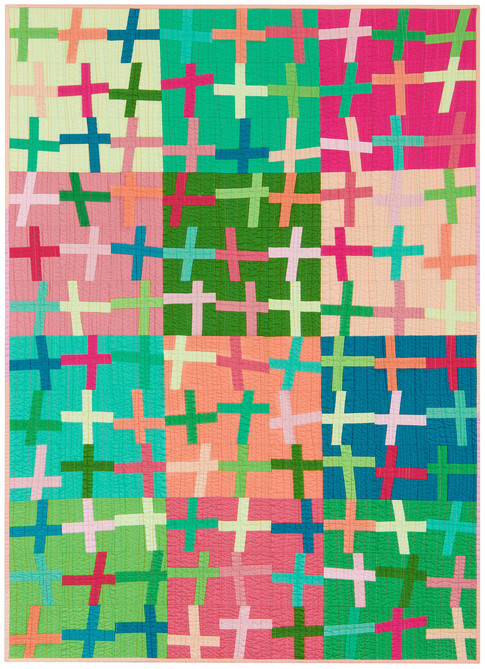 Because many basket quilts are set on point, they can look difficult to assemble. 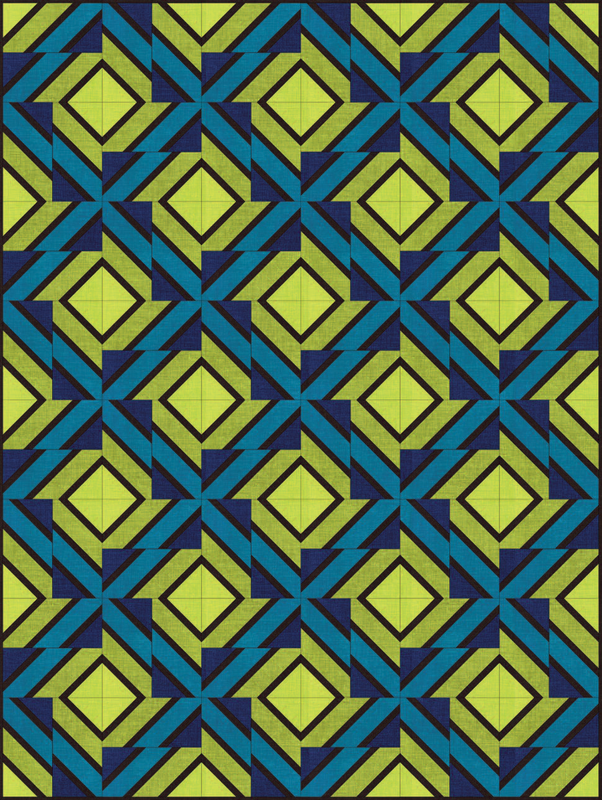 When we were new quilters, we were surprised to see that basket patterns are much less challenging to sew than they appear. 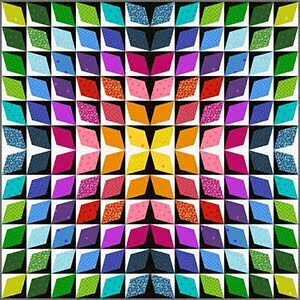 They are actually sets of squares, half-square triangles, and rectangles which are pieced together and can be efficiently sewn by machine. 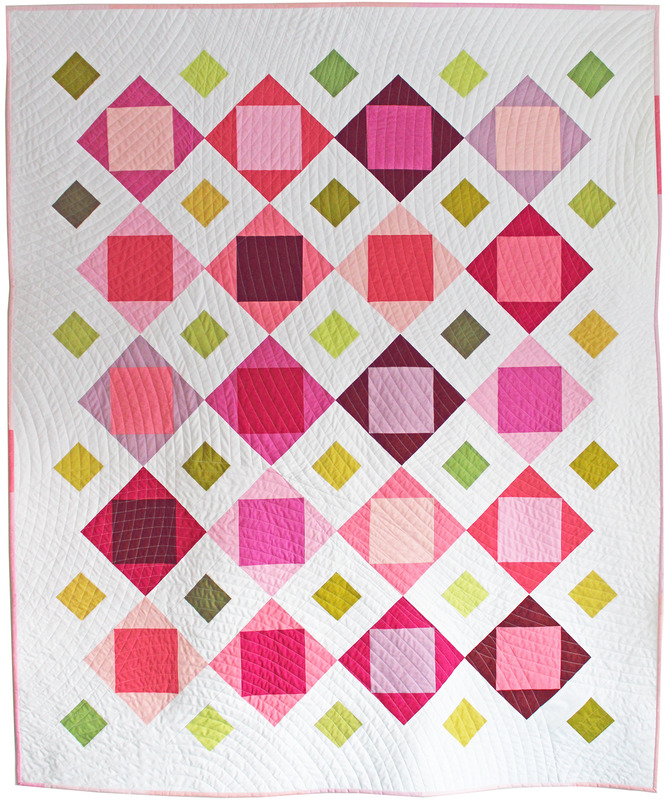 Here's an adorable Cherry basket quilt, made from a variety of luscious red fabrics. 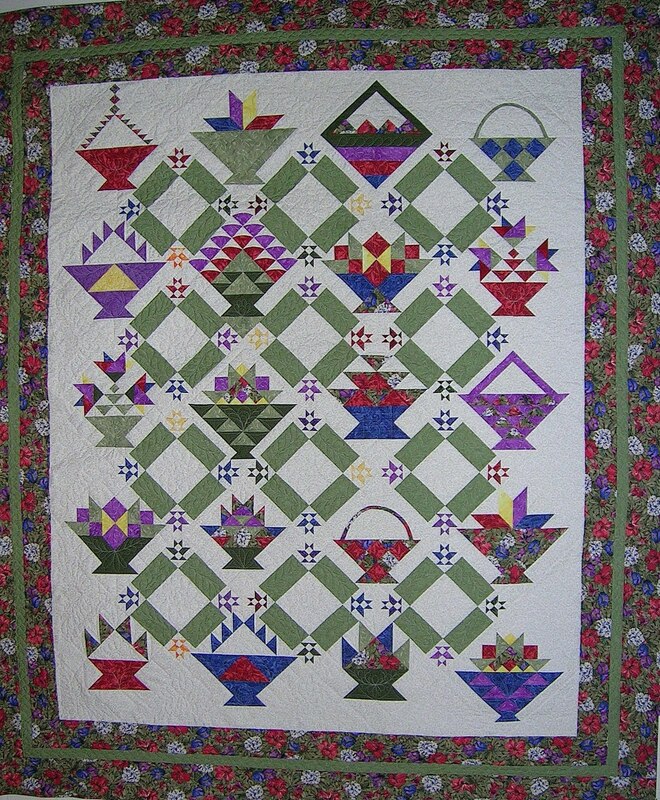 For a traditional Cherry basket look, Lisa has pieced one large wide triangle for the main part of the basket, with two small triangles for the base. 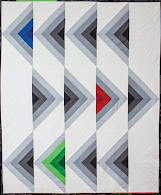 She has then turned the square block on the diagonal, as explained above, and has appliqued the curved handle. 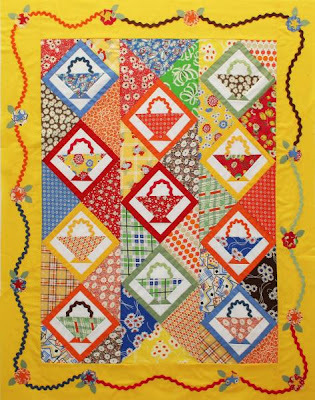 Lisa has achieved a lovely contrast by using white background fabric to really make the baskets come alive and "pop" off the quilts. 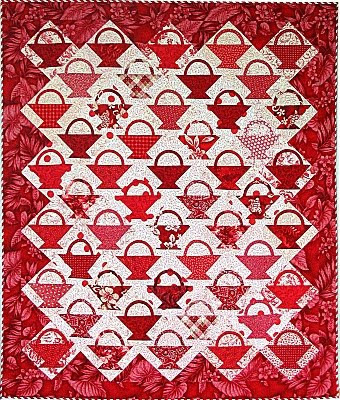 She's selected a large scale red print for the border that nicely matches the baskets. 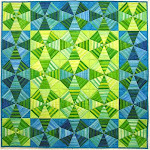 The pattern for this gorgeous quilt can be obtained at Lisa Boyer's website. 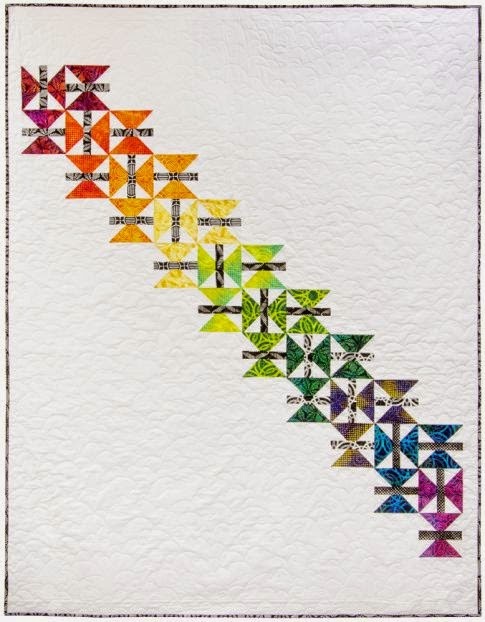 Lisa is also the author of two wonderfully humorous quilt books: That Dorky Homemade Look and Stash Envy. 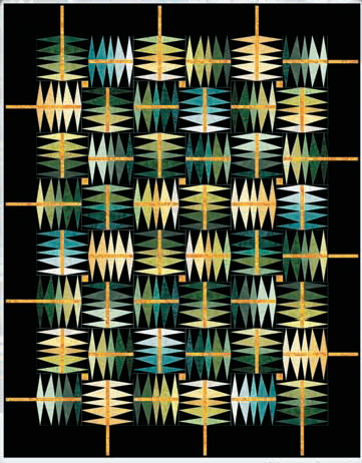 To see more of Lisa's creative work and patterns, please visit her website. 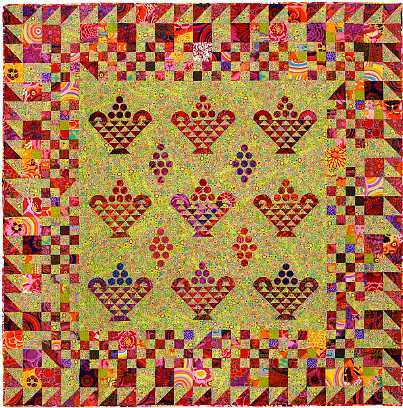 The irrepressible gaiety of Kaffe Fasset's fabrics are featured in his book Country Garden Quilts, which includes this delightful variation of a Cherry basket pattern. 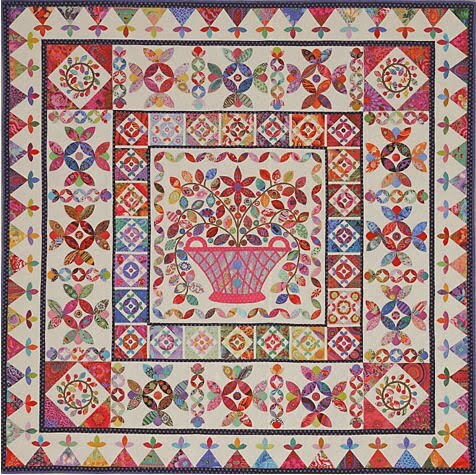 Instead of the single large appliqued handle, there are smaller handles on each side of the basket, separated by a stack of cherries piled in the basket, which gives a pleasing symmetrical effect. 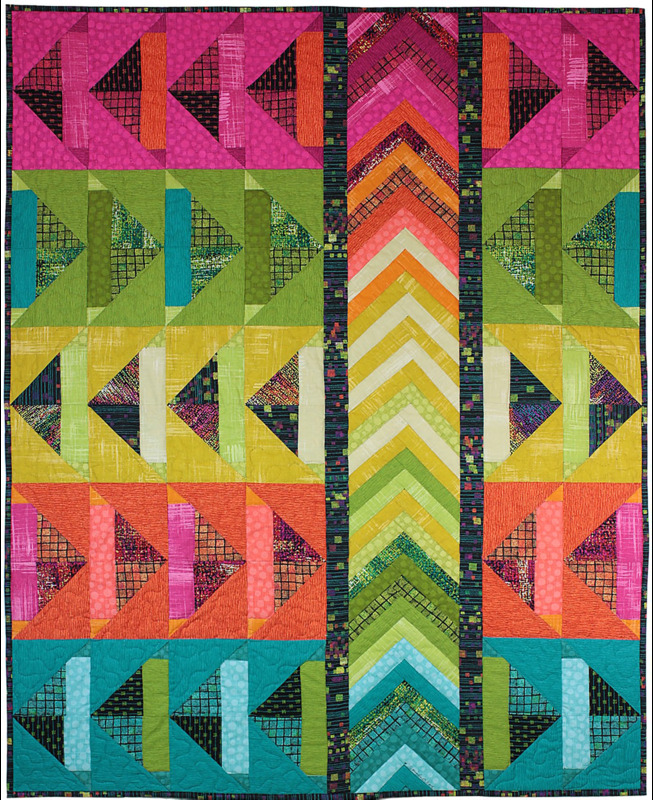 Like most basket blocks, these blocks are set on point, and the vibrant border of half square triangles mirrors the half square triangles of the basket blocks, thus creating an elegant cohesiveness. 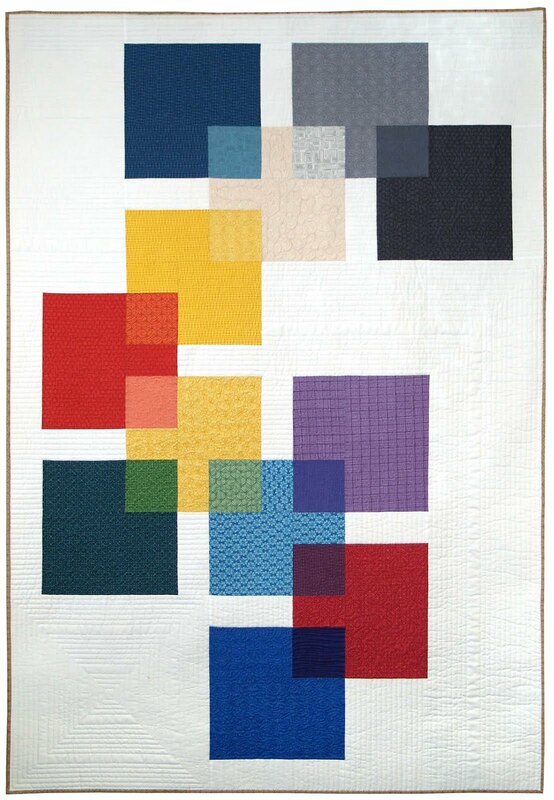 To save time, a kit with the exact fabric needed to replicate this quilt is available at Glorious Color. Red and white together is such a brisk and breezy color combination, that it's perfect for a summer quilt project. 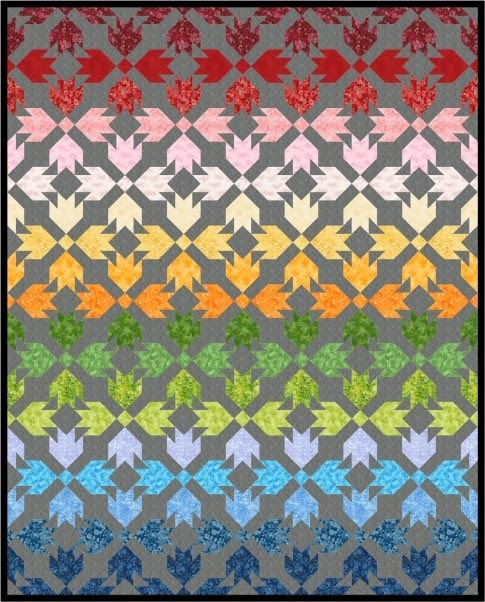 Click on the image to enlarge it, and you'll see a surprise in the center. In addition to patchwork, this quilt contains blocks of redwork embroidered cherries, stems and leaves. Surrounded by nine patch blocks, the baskets with their triangles pointing straight up, are often known as the "cake stand" pattern. 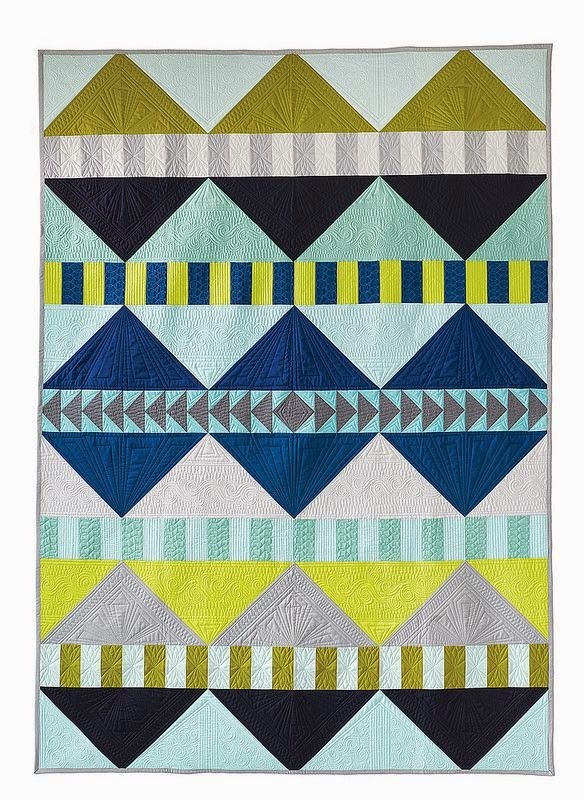 The crisp outer border of prairie points is the perfect complement to the inner border of white triangles used to set the nine patch on point. 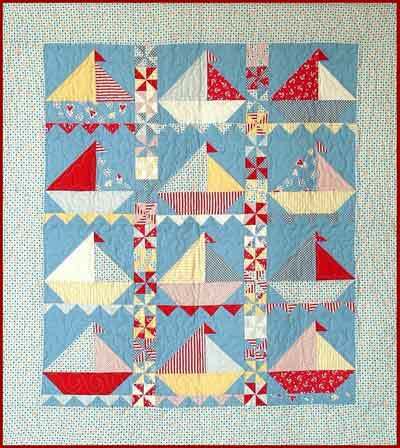 Cherry Delight and dozens of other darling patterns are available from JWD Publishing. Alice Kay Arnett has done a wonderful job with these 20 different colorful baskets, including several different cherry baskets and cake stands. 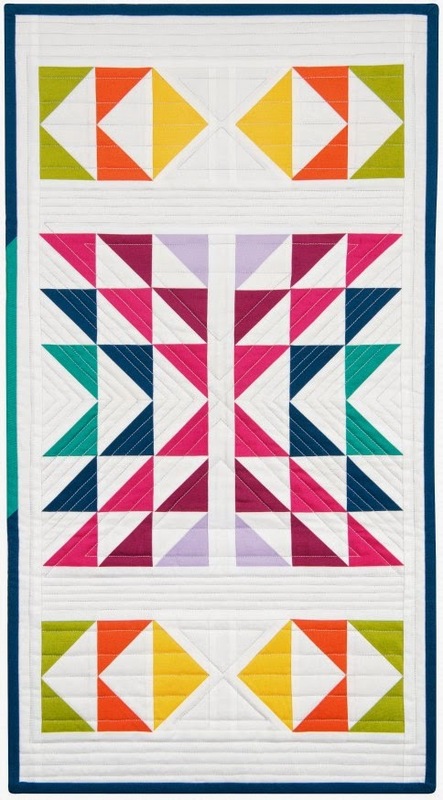 One of the most charming features of this quilt are the incredibly cute miniature blue and pink baskets that peek out from the sashing. 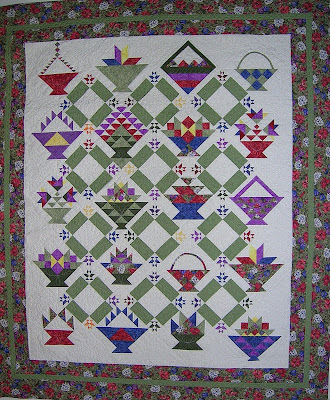 The flowered border works perfectly to complement the clear red, blue, and green solids used for the basket. 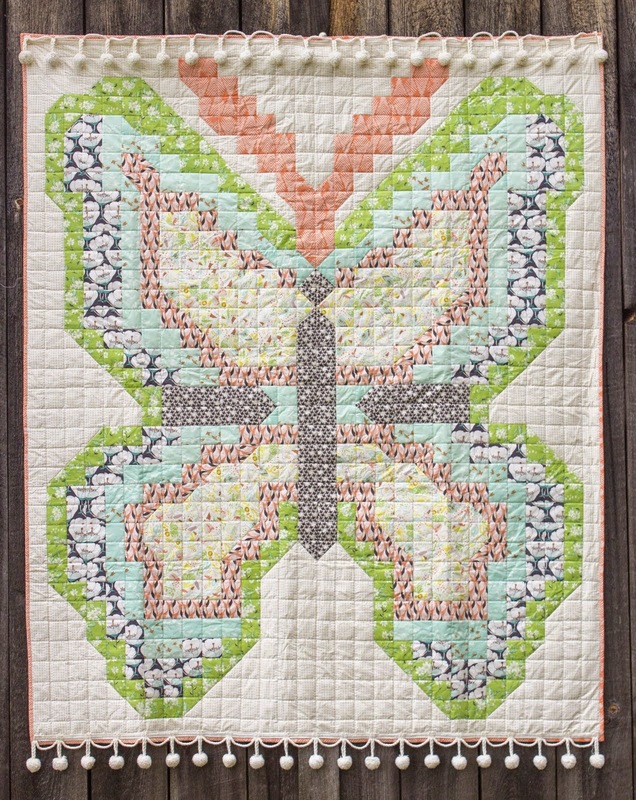 For more inspiring quilts, and information on Alice Kay's workshops, visit Alice Kay Quilts. Winners of the July Giveaway ! 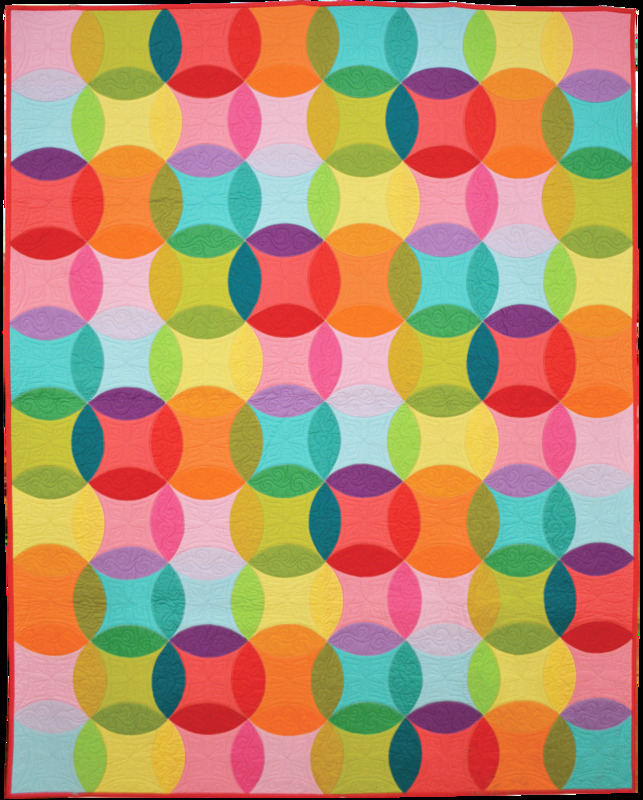 who won the July Giveaway at Quilt Inspiration ! 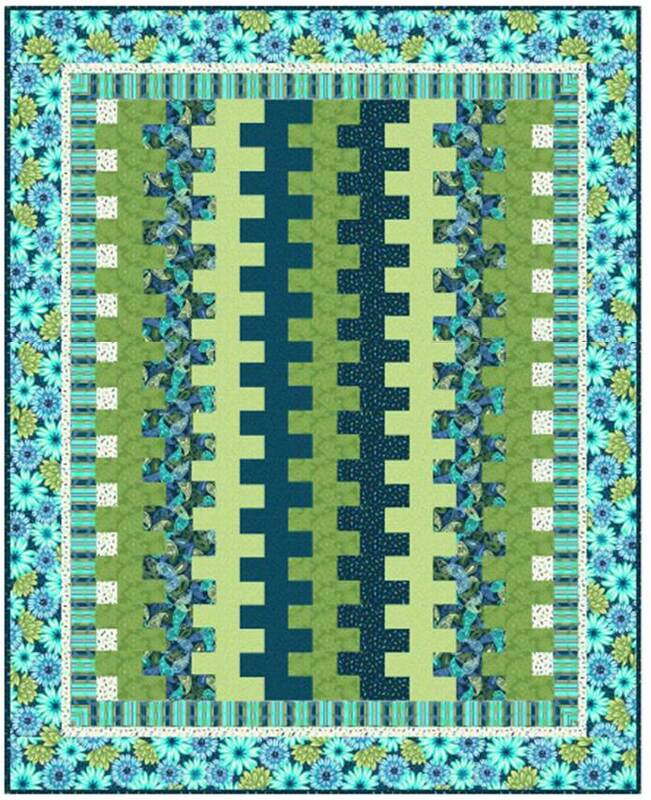 If you did not win a prize this month, we send our condolences to you; and we invite you to enter next month's August Giveaway, which will feature gorgeous fabric from Hoffman California-International. Thank you, everyone who entered the giveaway, for your very kind comments ! Those really brightened our day. 1. 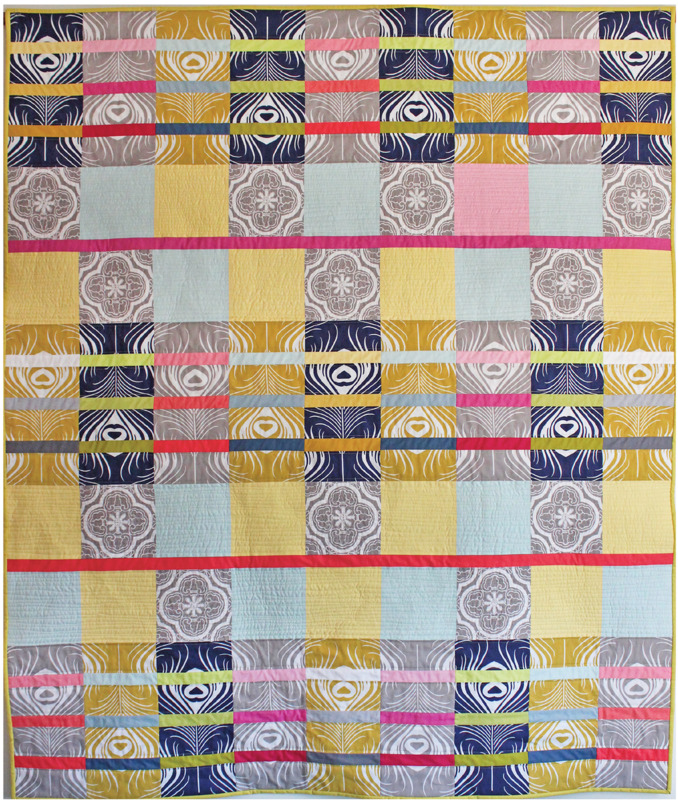 The winner of Kona Bay Fabrics "Chrystanthemums and Waterfalls" is Kantia ( Manoli from Spain). 2. 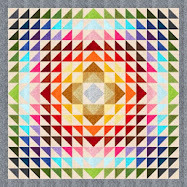 The winner of Diamond Quilts by Jan Krentz is Pip At Rest Is Not Idleness. 3. 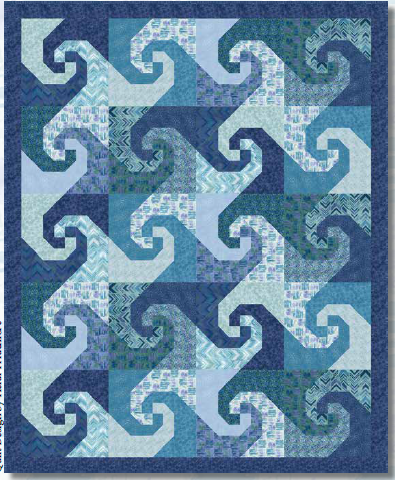 The winner of 2 McCalls' Quilting Magazines is Vicki . 4. 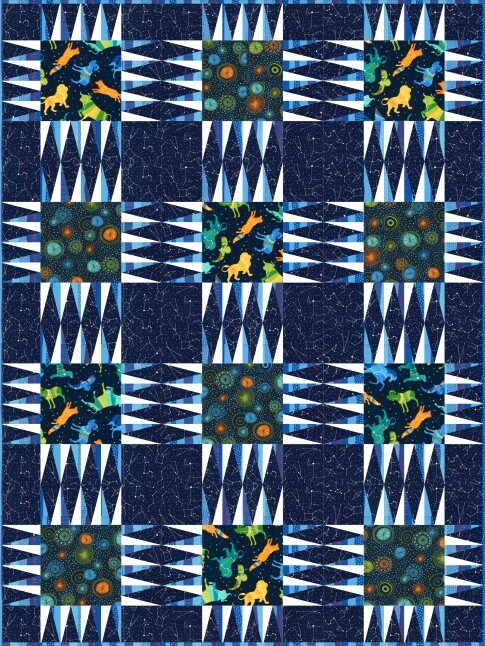 The winner of the Country Bears quilt pattern and P.S. I Love You book is Crochet n' Quilt. 5. 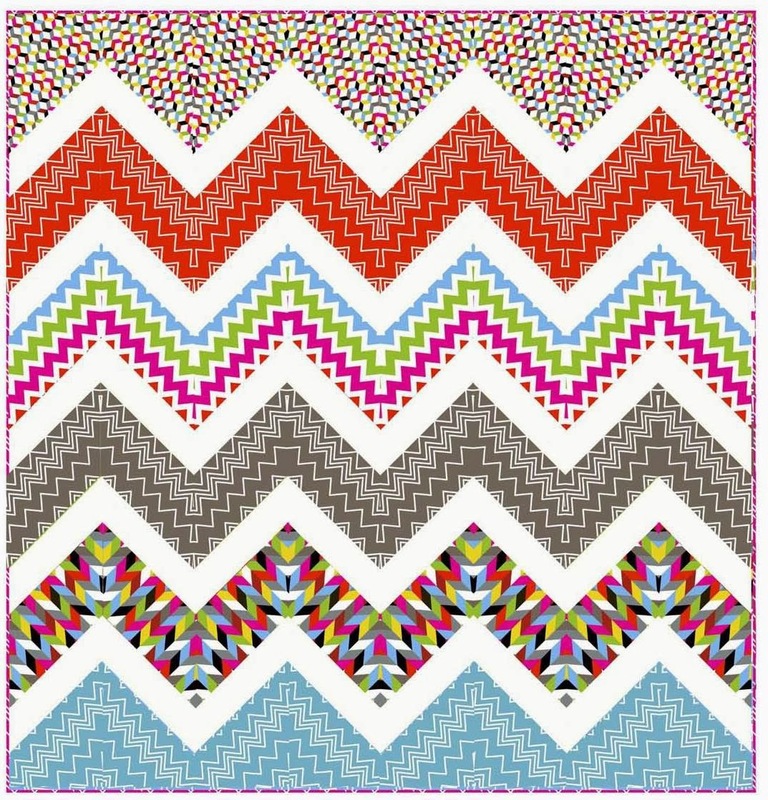 The winner of the $ 5 gift card from Jo-Ann Fabric and Crafts is Char. 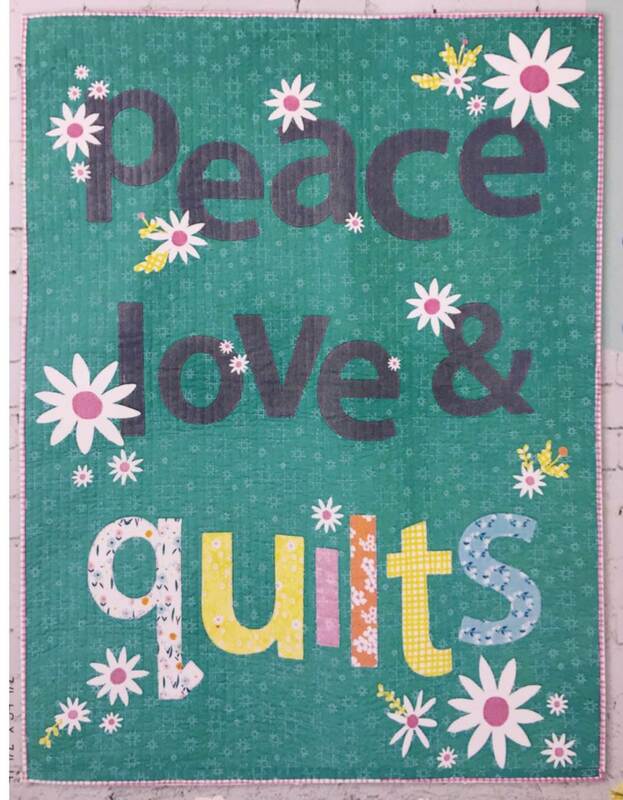 quiltinspiration@gmail.com . We'll send your prize to you, postage paid.